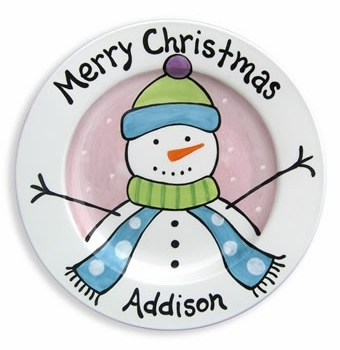 These Christmas snowman plate with pink background are hand painted with extremely tiny brushes. Cheery and full of personality, these plates brings a stylish twist to traditional themes. Every plate has its own story. 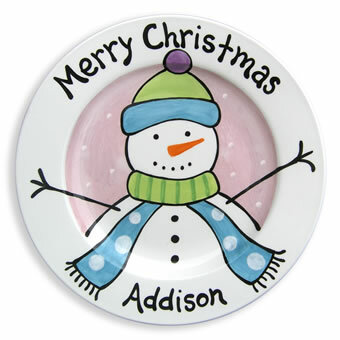 Personalizing every plate with names transforms them from super cute plates to treasured keepsakes. Plates are available in two sizes. The backside of the plate can be inscribed with up to 8 words. All dinnerware is food safe and dishwasher safe. Although it will withstand the microwave, it is not suggested since it will eventually cause cracking over time.